Thirty people joined market analyst Stephen Howarth and I for BPEX Live, our online workshop this week. Stephen explained how production costs vary between key pig-producing countries. His data also suggested priority areas where British producers should focus to help improve their pig performance and reduce their costs of production. While our finishing herd efficiency is pretty good and on a par with the European averages, our breeding herd performance is still behind. The number of pigs weaned per sow per year in Britain is the lowest in the EU at 22.56 (2011 figures). 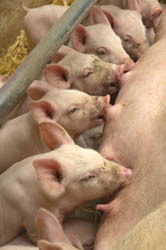 The EU average number of pigs weaned per sow per year is 25.10, with Denmark and the Netherlands averaging more than 28. Please also type in any questions or comments you may have below. Thanks for sharing the useful and informative blog. I admired your work.